Among the concerns listed by Jack Sprat is the story that the Vatican closed and evacuated its 500-year-old library believed to hold a collection of rare and valuable books, perhaps the only ones of their kind in existence. The suggested reason for the closure, which has been flying around the Internet, was that the library was in danger of being flooded because of a calculated 60-meter rise in the sea level caused by melting arctic ice. That was untrue, however. 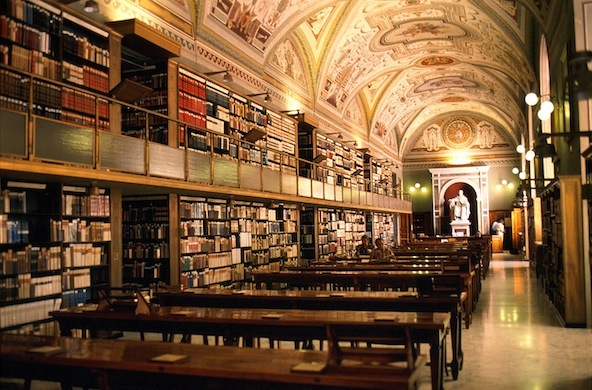 We are happy to report that the Vatican library is now reopened after a three-year shutdown to accommodate a $7.5 euro renovation that began in 2007. It turns out that dangerous structural weaknesses were discovered in the Sixteenth Century building housing the library. The work involved reinforcing the foundations and floors to not only save the building, but the precious collection of works within. The work included the installation of climate-controlled rooms to protect the ancient manuscripts, and a state-of-the-art security system. The closing proved extremely frustrating to biblical scholars and historical researchers from all over the world who come to Rome to dig through the amazing collection of ancient manuscripts stored there. Like the British Library and the National Library of France, the Vatican library is thought to contain one of the most important manuscript collections in the world. The library's collection includes the oldest known complete Bible, dating from about 325 A.D. It was believed to have been one of 50 Bibles commissioned by Emperor Constantine. The library contains an estimated 70,000 books. Between 4,000 and 5,000 researchers are given permission each year to conduct research in the library, but access is generally limited to academics doing post-graduate level work. To protect the books and manuscripts, everything is outfitted with computer chips so they cannot be carried out of the library. Also closed-circuit cameras and automated entry and exit gates record who comes and leaves. None of the material can be removed and all research must be conducted in the library. Yes, Mr. Sprat, the Vatican Library was temporarily closed. But it appears it was done for a good reason and the library now is reopened.